Newtown Pool League are delighted to announce a new sponsor partnership with Llanfair Caereinion stoves specialists, Mid Wales Stoves. The sponsorship begins this season and features a company run by Lee and Donna Cruse, with Lee very well known to the League for his long association with the Red Lion team from Castle Caereinion. 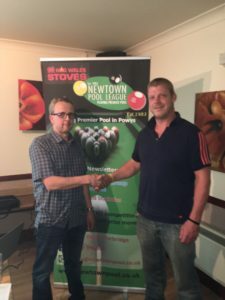 Newtown Pool League are very pleased to form this new partnership and to link up with a successful local company. Mid Wales Stoves have an expansive showroom in Llanfair Caereinion featuring over 50 stoves on display with some live displays on offer as well. The company is a one-stop shop for all fireside products and accessories and can supply all fuels to keep customers going throughout the year. Mid Wales Stoves’ aim is to supply and install high quality wood burning and multi-fuel stoves at competitive prices which can accommodate all budgets. Lee Cruse is a full time HETAS installer and is assisted by another full time installer with years of experience in this industry. They work with world class manufacturers such as Jydespejsen, High Flame, Hunter Stoves and many more.